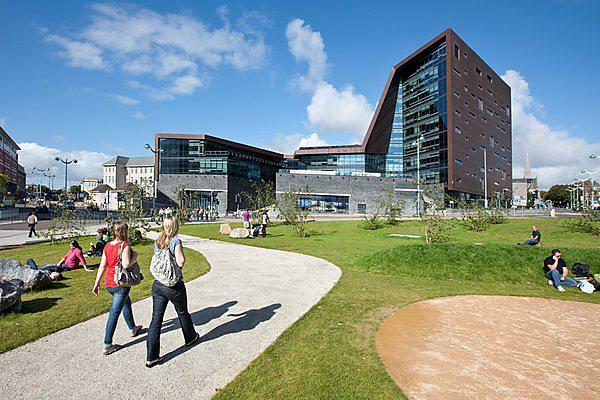 The University of Plymouth contributes nearly £900 million and almost 9,000 jobs to the UK economy on an annual basis, according to a new report. The institution generates more than £460 million of output for the city of Plymouth, and nearly £600 million for the region, as well as providing £60 million of UK exports. And among a raft of socio-cultural impacts, its staff deliver more than 255,000 hours of voluntary public service worth around £17.6 million. The figures have been revealed following the publication of the Social, Cultural and Economic Impact Assessment for the University of Plymouth. Undertaken by Viewforth Consulting, the assessment evaluates both the direct economic impact of the expenditure of the University and its students, as well as the broader economic, social and cultural value generated by the institution’s activities. The report was released at a special event, today (Friday) at which Alistair Jarvis, Chief Executive of Universities UK, delivered a keynote speech on the ‘Civic University’ and its relationship with its local and regional communities. The report reveals that the University contributes £897.5 million of output to the UK economy, creating 8,769 FTE (full-time equivalent) jobs, and generating £474.5 million gross value added (GVA) to the UK’s Gross Domestic Product. Across the Heart of the South West LEP area, the University generated £585.2 million through direct activities and the personal expenditure of students and international visitors; 5,882 jobs; and £324.2 million GVA. For the city of Plymouth, the University created a total of £468 million output, £268 million of GVA, and 4,777 FTE jobs; and it generated nearly £50 million of output and £22.7 million GVA in Cornwall and the Isles of Scilly. Student volunteering contributes £169,190 to the local community, with a total contribution of £427,000, including fundraising. University staff deliver more than 255,000 hours of voluntary public engagement and public service activity, over and above their core jobs, worth around £17.6 million. NHS dental treatment delivered by the University’s Peninsula Dental School valued at £773,000, with quality of life gains to vulnerable people estimated at up to £9.4 million. Around one hundred delegates attended the event at the University, which reflected upon the recent establishment of the Civic University Commission (CUC) and its major new independent inquiry across the country into the future of the ‘Civic University’ and how it can most successfully serve its place in the 21st century. In addition to the keynote lecture from Alistair Jarvis, there was a round-table discussion involving Richard Brabner, Director of the UPP Foundation; Deborah Fraser, Regional Director of the CBI; Rozzy Amos, Regional Director of the Prince’s Trust; Adrian Dawson, Director of Research and Innovation at the University; and compered by Professor Iain Stewart, Director of the Sustainable Earth Institute.